Despite accidentally costing his team a game against the Penguins, rookie Niklas Backstrom is still Calder-trophy worthy. This week’s Mailbag takes on a number of different subjects, so let’s get rolling. Interesting article. Now that (Nicklas) Backstrom has scored a nice clean goal on his own net to help sink the Caps’ chance of a playoff birth do you think my sentimental favorites Kane and Toews stand a better chance? A better chance? No. The two are among the favorites for the Calder. I can’t believe any voter would be so shortsighted to dismiss Backstrom’s season based on one mistake. I used to love reading your column! Then, it went away for a few weeks in the beginning of 2008, and now it is hidden (along with the other features on NHL.com) all the way on the bottom, after the NHL on NBC ad and everything. Just putting my vote in against the new NHL.com design. I liked the old one where I could see your column and not forget about it and where I could do the poll. That's it for tonight, Phil. Goodnight. Love diehards like you Zach. Actually, Ice Age is pretty easy to find. It is in the Features section each weekend as well as on the Weekend Edition page you can access from one of the main panel each weekend. I am looking for a little insight on the Flyers and their playoff hopes. Now they have gone through some up and down times this season, most notably their recent 10-game losing streak. With a lot of injuries throughout the season to the likes of Mike Richards, Derian Hatcher, Daniel Briere, Joffrey Lupul, Simon Gagne, as well as playing with injuries in Jason Smith and Jaroslav Modry, what does this young team have in store when healthy? With the addition of Prospal up front and Modry (although no longer what he used to be) on the backend, what can we expect with a healthy lineup, and in the playoffs? When the team was, for the most part, healthy they were able to climb to 2nd in the Eastern Conference and proved to be a team back for redemption. Will we see that same team again soon this season, or are the injuries really hampering that thought? As for next season and the few after that, I believe that this team will be Cup contenders as early as next season if not the next. They aren’t looking at losing much to the free-agent market, which is great for this young team. Unfortunately, it may come down to either Jeff Carter or R.J. Umberger, but with the way Carter has been playing with the additional ice-time it is hard to not want him. What are your thoughts on the 2007-2008 postseason as well as the following two years for this young club? Hi Kyle. We can come up whatever pun we want about injuries hurting a team, but you can’t overlook their impact. Losing Simon Gagne certainly does impact the Flyers, as do long-term losses to any significant player. In the short term, having players in and out of the lineup can ruin a team’s continuity, so you can’t overlook injuries as a factor. But I think there are two other elements where the Flyers need to pick up their game to hold off the teams below them in the Eastern standings. One would be a better record at home. As of Tuesday, the Flyers were 16-13-3 playing before a very partisan home crowd. Taking care of business at home would have produced some much-needed points to the ledger. Also, Philly’s goaltending needs to step up. Neither Martin Biron or Antero Niittymaki have taken their games to the elite level this season. Stronger goaltending down the stretch is essential for the Flyers to secure a playoff berth. As for next season and beyond, the Flyers have assembled a strong roster, when healthy. Mike Richards, Joffrey Lupul , Scott Hartnell and Scottie Upshall are a solid core up front. Obviously more was expected from Daniel Briere, but I wouldn’t give up on him. It will be interesting to see what decisions the team makes on potential UFAs Jeff Carter and R. J. Umberger. Both could fit into the core, but with the salary cap, the Flyers may not be able to keep both. Why does the NHL promote Canadians like (Sidney) Crosby, while neglecting Russians? (Evgeni) Malkin is better than Sid because he makes people better like (Mario) Lemieux did. Look at Jordan Staal's goal totals last year on Geno's wing. Look at Ryan Malone's numbers on Geno's wing (Petr Sykora's too) since Crosby's injury. Malone languished on Crosby's line while exploding for a career year in just 20 games on Malkin's line. Geno's currently second in the NHL in scoring because AO had a five-point night to overtake him and yet he wasn't even selected to the All-Star game. Remember before he was added, Marc Savard was added & that was blatant discrimination. Ovechkin is the best goal scorer in the world and all you hear is Crosby, Crosby, Crosby. I'm from Pittsburgh and I know hype from great hockey players. You can throw in (Pavel) Datsyuk and (Ilya) Kovalchuk too. 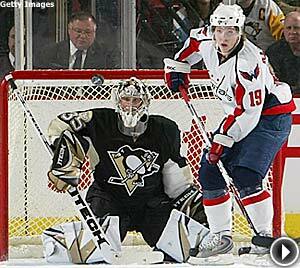 Let’s see, last week NHL.com did in-depth profiles of both Malkin and Ovechkin, while also looking at the influences of Sergei Gonchar on Malkin and how the addition of Sergei Fedorov would impact Ovechkin. At All-Star, NHL.com also did significant pieces on Datsyuk and Kovalchuk. Seems to me we talk about as many players as possible here at NHL.com and we don’t really care what country they come from. As for All-Star selections, there are numerous factors that go into that. For instance, Marc Savard, coming off several strong seasons, had not been named to an All-Star Game and is considerably older than Malkin, who figures to be a multiple selection over the course of his career. You may not like the decision, but we get lots of emails from folks who made cases for a number of other players too. It’s not discrimination, it’s the physical limitations of the roster. One reader asks where former Thrashers' head coach Bob Hartley will end up. To preface, I am a Bob Hartley fan from his days in Hershey and his summer camps in York PA. The results in Atlanta after Bob’s premature firing are bittersweet. What are Bob Hartley’s prospects? And will there be any concern by Thrasher ownership of Don Waddell’s decision to fire Hartley, particularly with the terrible results this year? Hi Jim. As unpleasant for you and Bob Hartley, there really wasn’t much else the Thrashers could have done at the start of the season. Remember the 2007 playoffs? The Thrashers struggled mightily against the Rangers and then to have a long losing streak to start the following season really presented few options. As the late, great Max McNab once told me; “like it or not, it’s easier to change the coach than the players.” That said, the Thrashers have a number of veteran players approaching free agency, so I wouldn’t be surprised to see a big change there and see a number of younger players get meaningful minutes next season. Just happened to come across your column while on the NHL Web site. I've asked this question several times on the Bruins' Web site (I am a die-hard Bruins fan) and haven't received an answer yet (understandably, they can't answer all questions), so I though perhaps you could answer it. In watching the Bruins games, I often find the officiating questionable. There seems to be more and more instances where the officials "blow" a call; especially when they show the replays. I admit I am prejudiced when it comes to my team, but I've seen infractions go uncalled against the opposing teams as well. It is quite frustrating, especially when it makes a difference of winning and losing a game. Now that I've said all that, my question is; When the League reviews games and there are calls that are considered questionable (whether in the League's eyes or the coaches), do the officials receive any kind of a reprimand? If so, is it just a verbal reprimand or is there such a thing as these officials getting warnings and then suspensions? I'd really be interested to know. Much has been made of a couple incorrect calls in the last week or so, but I am going to stick with my guns here. The officials get the calls right virtually all the time, and they are making decisions without benefit of video replay. At home, we see the replay and moan and groan about calls. Well, try making these decisions as they happen. Sure, what will look like a hook from the referee’s angle may actually prove to be nothing, but you have to call them as you see them. As for scrutiny, the officials are in constant contact with Director of Officiating Stephen Walkom and his staff. They are provided with video of plays that come into question and receive feedback on a daily basis. Thank you for taking the time to read my email and hear my opinion. I strongly disagree with any talk of Alexander Ovechkin winning the Hart Trophy, also known as the Most Valuable Player to his TEAM. After back-to-back losses to the Bruins and then most recently today the Penguins the Caps are on the outside looking in, and time is surely running out, even though Alex accounts for a large number of the Caps’ total goals, him doing this well is really harming them in the long run more than helping them. If they miss the playoffs and finish 9th, 10th, 11th, sure he had a good season, but they missed the playoffs and don’t get as good a draft pick as they could have. They would miss the playoffs with or without Alex, so his value decreases large when his team doesn't make the playoffs. I really think the emergence of Evgeni Malkin after the reigning Hart and Art Ross trophy winner Sidney Crosby went down, he kept Pittsburgh alive and well during the nearly two months Sidney was out. Sorry Patrick, gonna have to disagree. The Caps may not make the playoffs this season, but telling Ovechkin or any other player to shut it down to get a better draft pick goes against all the reasons why we like sports. Ovechkin has been a huge positive factor for the Caps this season and he’s also among the most entertaining players around, so I don’t want him not going all out. Had he not played as well as he did all season, chances are the Caps would be out of playoff consideration. His great play has been a big reason the Caps remain in the hunt and I don’t want it any other way.